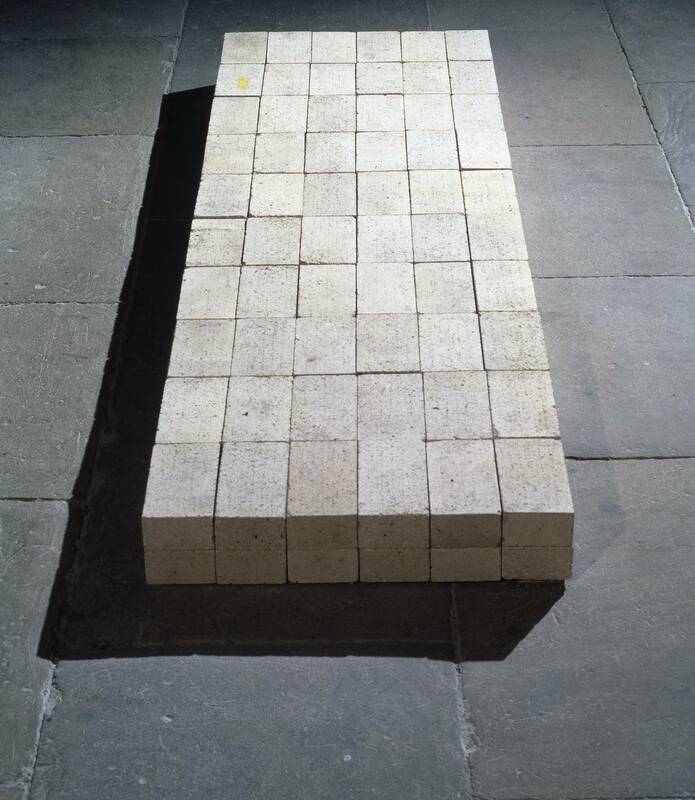 In 1972, the Tate Gallery bought for an ‘undeclared sum’ – although later revealed to be £2,297 –  the 1966 sculpture by Carl Andre, Equivalent VIII (also referred to here by its Tate catalogue reference T.1534). In April 1976, The Burlington Magazine published an editorial which questioned the Tate’s decision to buy the work  and placed the magazine at the centre of a complex and, at times, heated debate around the subject. The editorial prompted the Tate to demand a right to reply that would, eventually, be granted in the form of a five page article – long in comparison to most published in Burlington – written by Richard Morphet who was then Deputy Keeper of the Modern Collection at the Tate Gallery. Equivalent VIII (illustrated here) consists of 120 grey sand-lime fire bricks, arranged in a rectangle measuring 68.6cm by 229.2cm by 12.7cm deep. It was originally made as part of an installation of eight different configurations of the same number of bricks, to be arranged together on the floor of a single gallery space. Having been bought and exhibited as a separate work of art, an ‘outtake from Equivalents’ as the critic John A. Walker described it, Equivalent VIII was removed from the context of the complete work and thus detached from the ‘relational complexity’ of the original installation. The Burlington editorial was itself prompted by an article by Colin Simpson in the Sunday Times newspaper , published two months previously on February 15th 1976, nearly four years after the purchase of the sculpture was made. Alistair Rider has suggested that the Sunday Times itself would not have picked up on the issue ‘had the art collector and critic, Douglas Cooper, not conducted a campaign to undermine the cultural authority of the Tate’ and drawn attention to the Tate Trustee’s latest Biannual Report of Acquisitions. 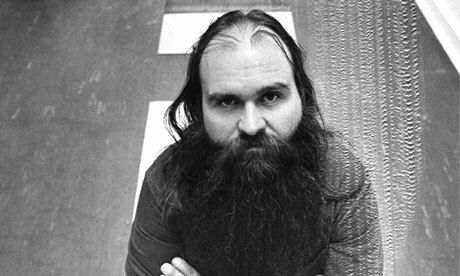 In his article, Simpson talks the reader through some of what he deems to be the more controversial artists whose work had been named in the report of purchases. Although also listing Gilbert and George, Claes Oldenburg and Victor Burgin, the focus of the article is Carl Andre and his bricks; Simpson does not refer to the work by its title throughout the article. The inference made by Simpson is that the Tate had somehow been duped into buying the bricks, and the author reduces the artistic process to a ‘sudden’ decision to arrange 120 bricks ‘in a low pile on the floor of an art gallery, put a price tag of $12,000 dollars on them and wait for customers’. In the ensuing days, the story was taken up by numerous newspapers, perhaps most famously the Daily Mirror, the front page of which declared, ‘whichever way you look at Britain’s latest work of art… what a load of rubbish’. This is not to suggest that the purchase was universally derided. Hugh Jenkins, Arts Minister at the time, argued that ‘the Trustees of the Tate have every right to spend a little on experimental art. I do not question their judgement.’ Although the Burlington editorial also claimed – disapprovingly, it should be noted – that Jenkins was said ‘to be enquiring into the purchase’ and discussing the matter with senior officials in his Department’. However, the editorial went beyond simply repeating the complaints of the popular press and was certainly more than an ‘attack’ on the Tate. In fact, the author raised some pertinent and timely questions regarding the responsibilities of publicly funded art institutions and their activities in the market, as well as broader questions regarding expanding definitions of art (especially in relation to value, both aesthetic and monetary). Although, with hindsight, The Burlington Magazine appears to have been on the wrong side of the argument, in that posterity has proven the historical significance of Andre’s sculpture, it is certainly worth revisiting the controversy in order to reassess the role played by this magazine in the debate and the historical, and continuing, significance of the issues raised. in its criticism of Tate policy historical considerations have been abandoned. No attempt is made to answer the question whether ‘Minimal’ art constitutes an important phase in the development of art and if so whether Carl Andre’s work… is among the most important produced within that phase (even though its significance extends well beyond the ‘Minimal’ field). just how far a public Gallery, which must impose its own kind of order on what it acquires, can go to accommodate changing attitudes towards art. At what point, if any, does it have to draw the line? What may be considered of contemporary significance by the Tate’s board of trustees may not withstand the test of time and taste, and may not even be considered art at all by future observers. the Andre will, in time, be generally accepted as among the important art of its period. This cannot yet be proved or disproved. But it can at least be said that the Burlington’s opposition to the purchase is consistent with this possibility. In support of this argument, and in lieu of the Burlington’s lack of historical contextualisation, Morphet locates Equivalent VIII firmly within a tradition that can be traced back to Constantin Brancusi’s endless column, via Frank Stella’s Black paintings, which emphasized ‘with a new directness both the physical structure of the whole art object (paint, canvas, stretcher) and the means of its execution’. Morphet suggests that ‘both the mode of assembly and the scale of [these artists’] works so embody a sense of human proportion, naturalness and limpid clarity as to make these works positive statements of general relevance to society’. Therefore, the centrality of mass to the meaning of Andre’s work further defends the necessity of Tate’s purchasing the work rather than simply collecting ‘full documentation[…] so that they can be reconstructed whenever the need arose’, as suggested in the Burlington editorial. These artists (Brancusi, Stella, Andre), Morphet argues, ‘were among the pioneers of an impulse which in the 1960s became so widespread as to be a major characteristic of the decade’s art’. Thus the Tate’s new acquisition is framed not as ‘effective and showy work which may well be regarded in a few decades as trash’, but rather as a work which could already be placed firmly in the canon of late 20th Century Western art. Morphet argues back that Andre’s bricks are far from art only in principle. He claims that ‘T. 1534 certainly gives rise to processes of thought and speculation about both art and life’ and that, in doing so ‘the multiplicity of these responses is an index of its vitality and complexity’. The fact that ‘most good ‘Minimal’ and ‘Conceptual’ art, far from abandoning concern with direct, object-linked sensuous experience, actually extends its scope’, although ignored by the media ‘should be obvious to anyone who looks at such work without prejudice’. The implication here, it seems, that the Burlington is as prejudicial about modern art, and therefore as unqualified to address it, as the popular media. The type of brick employed in T.1534 was no less carefully selected than that employed in its first version, and unless made of this kind of brick, T.1534 does not exist. Thus physically, as well as an idea, it is, in its own right, an important work by Carl Andre. should be looking just as hard at painters working in a more academic tradition, like Seago or Cuneo, whose work is very popular, as at the latest avant garde productions. ‘Whether people like Andre’s art or not’, he asserts, ‘few can deny that its role in the development of art is more important than that of Seago or Cuneo’, and there is insufficient money available ‘to enable the Tate to acquire… good examples of all the types of art that are being produced’. In these circumstances, he argues, ‘the Gallery considers its main task to be the acquisition of a range of work sufficient to demonstrate, through examples of high quality, those distinctive tendencies favoured by the Director and Trustees in the periods for which the Tate has responsibility, including the present’. Whether or not the Burlington Magazine was right to shift attention away from its traditional areas of expertise, its participation in the debate surrounding Equivalent VIII moved the discussion beyond the tabloid tone taken by the majority of the media, including the quality press. By raising the question of the Tate Gallery’s role in the spending of public money, the magazine facilitated a more balanced treatment of the issue, first through its own critical editorial, and then through Richard Morphet’s response. At the heart of this debate is the question of the extent to which a publically funded organisation should be able to take calculated risks with public money. Although the Tate’s purchase of Andre’s sculpture has proven, with hindsight, to have been astute, the question remains pertinent, particularly as the United Kingdom gradually lifts itself out of another recession. The art market is, of course, very different now than it was forty years ago, and whereas the publically funded galleries and museums were the major buyers of contemporary and recent art in the country at the time, arts funding has been heavily reduced, and the private sector has taken on much of that responsibility. Charles Saatchi and other private collector/dealers now take those risks as to what will be the valuable art of the future, and nobody is too concerned whether, with their own money, they pick a winner or not. Alistair John Rider (2005) Carl Andre: Sculptures, Politics, 1959-1976, PhD, The University of Leeds, p.12. The Burlington editorial claimed that ‘the Sunday Times story had been engineered by a gleeful Douglas Cooper, who had lambasted the Tate and the bricks six weeks before in one of the regular articles that he writes for Books and Bookmen’. (Burlington, p.187) However, The Burlington Magazine’s editors were forced to print an apology in the July issue stating that Cooper had not, in fact mentioned Andre’s work in the article mentioned, or spoken to anybody at the Sunday Times on the matter.